We get around ten cold calls a day from people wanting food explained Reverend Alan Dickinson. “In the first instance we ask them to contact a referring agency such as Age UK, the Council or Citizen’s Advice Bureau,” he said. Alan is the pastor at the Whitley Bay Christian Fellowship in Whitley Bay. He’s also the chairman and a trustee of the Bay Foodbank in Whitley Bay. We met in the carpark of the foodbank’s warehouse in Meadow Well, eight miles from the centre of Newcastle. “Our purpose is emergency food care. We haven’t got the resources to provide other services,” said Alan. “I’d rather not be running a foodbank but there’s growing demand and who else is going to do it? The Bay Foodbank deliveries more than 100 four day boxes of groceries each week to individuals, couples and families in the North Tyneside area. Since it was founded in February 2012 it has helped more than 25,000 children and adults. “We started the foodbank as a cupboard at the back of the church because people were coming to us asking for donations. Within four months we took on premises,” said Alan. 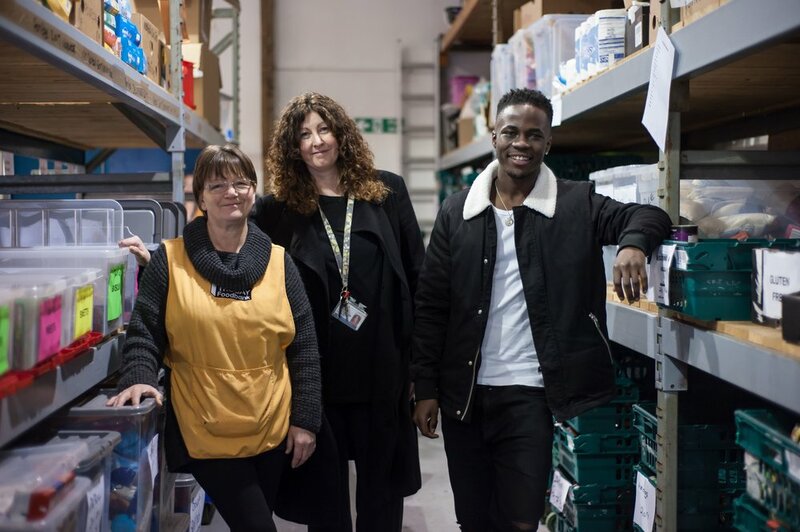 Almost five years later the project has two staff and an army of 50 volunteers, including Alan’s wife, foodbank manager Jackie Dickinson. The Bay Foodbank relies on food donations from the local community and supermarkets, and fundraising. Groceries and toiletries are delivered in a white van that looks much like any other supermarket delivery vehicle. Projects such as the Bay Foodbank show that while food poverty manifests as a local issue, its root cause lies in central government policy. “Systematic cuts to the welfare state and sanctions imposed on benefits as a penalty by Job Centres are the main reasons that people reach out to us. It’s often not poverty that brings people to a foodbank but a sudden drop in income,” said Alan. “We’re starting to see people who work and are perhaps on tax credits, and can’t make their income stretch to end of the month,” he said. The story of the rise of foodbanks was told in Ken Loach and Paul Laverty’s recent film. I, Daniel Blake. It's a powerful comment on modern Britain. The film was shot in Newcastle. Jackie plays herself in a foodbank in one of the most upsetting scenes in the film. Critics, including the Government, called out the film’s portrayal of the state as exaggerated. Talking to Alan it’s hard to reach any conclusion other than the storytelling by director Loach and writing partner Laverty was fair. Data gathered by a poverty charity tells the story of increasing demand for emergency food supplies. Between April and September 2016, foodbanks managed by the Trussell Trust distributed 519,342 three day emergency food supplies to children and adults in crisis across Britain. The figure for the same period in 2015 was 506,369; in 2014, 492,641; and in 2013, 355,982. “If you add independent foodbanks to the Trussell figures I reckon you can double the numbers,” said Alan. The Bay Foodbank has supported more than 4,500 children and adults in North Tyneside so far this year. Food poverty affects local communities everywhere in Britain. Check the Trussell Trust website or search Google for local foodbanks in your area. If you haven’t seen I, Daniel Blake, please do. It’ll sober you up quickly over the Christmas period. Next visit a local foodbank and decide for yourself whether I, Daniel Blake is an exaggeration as politicians claim or an accurate portrayal of modern Britain. In my view it’s firmly the latter. I was left numb by I, Daniel Blake, and unsure how to respond. Two weeks ago sisters Emma Webster and Sarah Hall provided an answer. Emma created a campaign called We, North Tyneside to collect groceries for the Bay Foodbank. She signed up more than 18 schools and a local hospital in North Tyneside to collect contributions from children, carers, parents and teachers. Sarah shared the story with the newspapers, television and social media. The Bigger Picture’s Angela Carrington shot photos including those used to illustrate this article. The local CIPR group arranged a collection. We visited the foodbank last week with children from Silverdale School and Whitehouse Primary to drop off more than 2,000 items of food and toiletries that have been collected via this grassroots effort. Kema Sikazwe, who plays China in the film, lent support speaking about the film with children and media. You can continue to drop off donations at the following schools, all of whom are participating in the We, North Tyneside project. Green Primary, Balliol Primary, Battle Hill Primary, Benton Dene Primary, Burradon Primary, Grasmere Academy, Fordley Primary, Forest Hall Primary, Ivy Road Primary, Marden Bridge Middle School, Shiremoor Primary, Silverdale School and ARP, Stephenson Memorial Primary, West Moor Primary, and Whitehouse Primary. There are also drop off points at the Newcastle University career service and the Freeman Hospital, or directly at the Bay Foodbank, The Barn, Meadow Well Way, Waterville Road, Meadow Well, North Shields, NE29 6BA. During December I’m collecting donations from people in my network and am planning to do a big shop for the Bay Foodbank at a local cash and carry. We’ve raised £600 already and have been asked by the foodbank to spend the money on goods in February which is an extreme time of crisis for many after Christmas. I’d really appreciate your support. This is a challenging time of year when foodbanks need extra resources. £10 would be fantastic. £20 would be amazing. I want to keep this as straightforward as possible. Please send donations via PayPal to me at stephen.waddington@gmail.com, or by post to me at 58 Colombo Square, Worsdell Drive, Ochre Yard, Gateshead NE8 2DF.